So many people critisize themselves and hate themselves for different reasons. So much they are unhappy with and unhappy with themselves. But the truth is, you cant hate yourself happy. You cant hate your body and expect to suddenly love your body or find peace with your body. 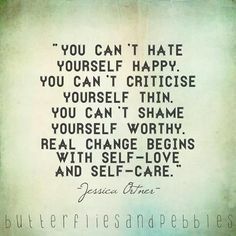 You cant hate yourself and your personality and expect to feel super happy.... of course, a certain hatred can lead to change which can make you happier (though not always. I know from personal experience that even if i changed my personality, my clothing, my body, my hair, i still hated it because the problem wasnt my body or myself, but it was my thoughts.). You need to focus on accepting and being kind to yourself, loving yourself rather than bringing yourself down and critisizing yourself. Because you know what... there are enough people in the world who will try to do that to you anyway, you dont need to do it to yourself. Instead if you find an inner peace and happiness, and stop focusing on all your "flaws" or negatives, but instead focus on the positives you will feel happier. Loving yourself, being positive and happy can take time, but it is worth the time. It is an investment to your future and future self. Stop focusing on the negatives and letting the negativity take over, instead focus on the positives. 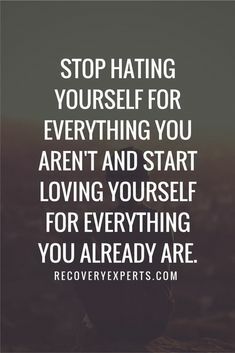 To love yourself change can be required, but remember that sometimes all that needs to change is your thoughts and mindset and everything else around you or your body. Mindset and thoughts are everything and the way you think determine alot in life. Hi Izzy - what you write is so true, but what about other peoples attitudes towards you and how they make you feel? That is really undermining. I find that often people are either patronising towards me or most definitely offish - I`m talking about shop staff here. Did you notice any attitudes when you were sick and underweight? I definitely do. They are either abrupt to the point of rudeness and stare at me or are patronising in that they address me as "lovey" or "dear". I don`t know how to handle it. So whatever confidence I have got just goes. Can I really look that bad? Does anyone else find this when they are out? Dear Carol, I know how horrible it is to be patronised for such things - one of the things I love about being at a healthy weight is simply looking unremarkable! It's a secret joy, which people who've never known the other way probably don't appreciate. But on the way there ... well, surely what random strangers think doesn't matter? You know your own truth. It was when it was people close to me that I struggled, but even then, in most cases there were other parts of life in which to build the relationship. If there were not, then I had to distance myself from the people involved, but later it was fine again. No point worrying about what other people think about something they don't understand. Own your truth, walk to the light. And share the smile when you're well enough to stop getting those looks! :-) Very best wishes. Thankyou so much for your kind words - I`ll keep them in my head when I am out. I long for the day when I can just look normal, but until then I`ll try not to let other people get me down because you`re right, they don`t understand do they? all they see is the person before them, not whats going on underneath. It can be tough when you find people glancing at you, treating you differently or giving you weird looks, but the best thing is to try to tune it out. They dont know you. And unfortunatly if you look "different and stick out" people stare, but also if you are underweight people become worried or even shocked. Its a natural reaction to seeing something which isnt the norm. But focus on YOU, you are doing the best thing to change and what strangers think shouldnt matter. I was - and still am - very good at tuning people out and barely notice people when i am out and about, but from what my mum and sister told me, alot of people stared at me when i was sick. But i never noticed it, and if i did notice it i thought they were staring because i was fat, which then lowered my self esteem even more. But in the end... it doesnt matter what strangers think. And like the anonymous above wrote, having some type of mantra can be a good idea or some type of reminder you can say to yourself when you feel your self esteem or confidence lowering because of how a stranger acts or what they say. You are stronger than that and it is just your eating disorder trying to bring you down even more.